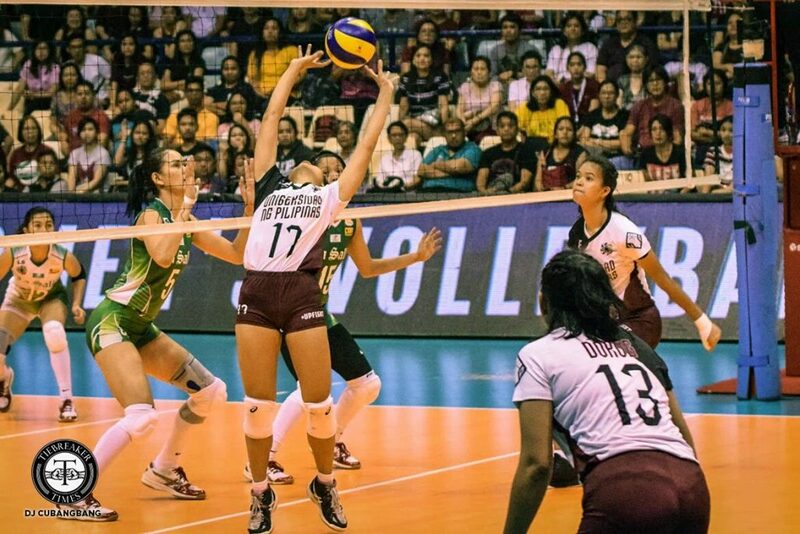 University of the Philippines (UP) Lady Maroons continued its dominance on De La Salle University (DLSU) Lady Spikers with a 25-16, 26-24, 25-19 sweep in the UAAP Season 81 women’s volleyball on Sunday at the Ynares Center in Antipolo City. Diana Carlos top-scored with 13 points, while Maria Lina Molde chipped in 11 markers for the Lady Maroons, which cruised to a 5-3 win-loss slate to a tie with Lady Spikers and University of Santo Tomas Golden Tigresses. The Lady Maroons took advantage of the Lady Spikers’ shaky plays in the opening set to build an 18-12 lead. DLSU made some lineup changes but only resulted errors allowing UP to take a 1-0 set edge. The Lady Maroons struggled early in the second set and were down 10-15 but slowly erased it to take a 24-23 advantage. DLSU then gave up points on errors to put UP at set point before Bacolodnon Jessma Ramos ended the set with a hit. The Lady Spikers tried to keep in step with the Lady Maroons in the third frame to even take a 17-16 lead but UP countered with a huge run for a 23-18 edge on a kill by Maristela Layug.